The emergence of Facebook, Whatsapp and other such social apps in the last few years has driven more and more people online through the smartphone. A large part of everyone’s life today is spent on the smartphone either speaking or communicating with colleagues, clients or family. Internet is becoming ubiquitous and school kids googling for homework is daily life. Increasingly, Google has become a proxy for self-learning. If you don’t know, just “google it”. While Google touches the lives of billions of people, it offers mostly unstructured or contextual learning which is great for problem-solving but is ineffective to build professional skills. Whether we are at the start of our career or many years into it, we are continuously seeking to add skills to be up to date, to prepare for the next promotion or even to prevent being laid off. More often than not we need to learn these skills in a structured way to apply them at work or home. Fortunately online learning and education has also evolved rapidly with platforms like Coursera, EDx, Udemy and Udacity. These platforms allow structured learning over a variety of courses through a combination of instructor-led or Self-paced programs. Most of these platforms also offer certifications for courses taken and in many cases online degrees too. These platforms are dramatically changing the way we learn and skill ourselves while reducing the cost of learning by democratising the access of education. Among these leading platforms is Coursera, a platform started by 2 Stanford computer science professors. Professor Daphne Koller and Professor Andrew Ng who shared their course online and ended up teaching many people who could have otherwise been able to enroll for their course. Anyone can take Coursera courses online. Duke University and many more. With Top faculty from these universities taking these courses, getting the experience of an Ivy league education has never been closer than this. Sample this, one of the most popular courses on courser is The Introductory Course on Machine Learning taught by Andrew Ng, (Co-Founder Coursera) has 36,365 ratings with an average rating of 4.9 from a possible maximum of 5. Assuming that not all learners who took the course rated it, the number of people who studied this course could easily be 100,000 + . That is an incredible number by any Standard. Machine Learning, Data Science and AI are all rage these days and Coursera offers some amazing options on these courses. The choices range from an Introductory course to specializations and even an online Master’s Degree. The best part about Coursera is that they are reasonably priced with most courses between $29-$99 (More Details Here) Most courses are free for learning and for course material but you might have to pay for project work, quizzes, Peer assignments and a Verifiable and Shareable Certificate. Coursera also offers Specializations programs that have a series of courses for small monthly payment per month and accredited online masters degrees that cost a lot less than what they do if you were studying in the University. Imagine your resume saying: “Certificate in Machine Learning and Data Science from Stanford University”. For those who’ve not had privileged childhood and education opportunities that is a powerful asset to add to their resumes. If you thought that Coursera is only about STEM (Science, Technology, Engineering and Maths) be prepared to be pleasantly surprised. Coursera has been adding a diverse mix of courses on its platform for Business, Art and Humanities, Personal Development and Social Sciences. 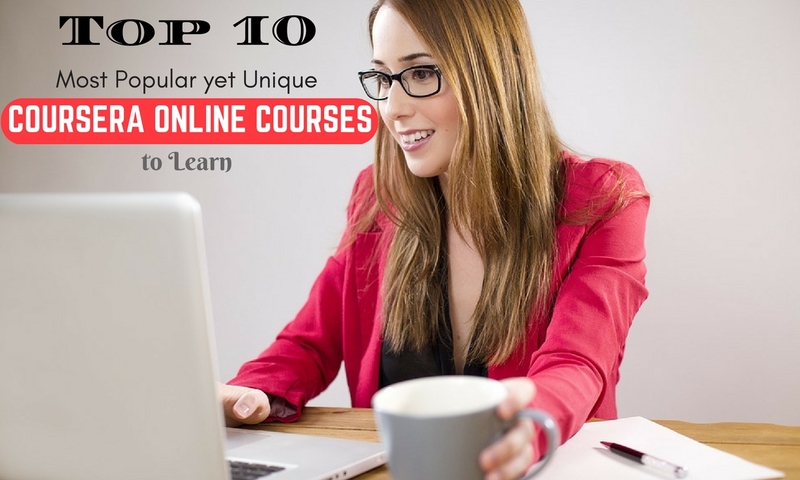 We’ve curated 10 of the most unusual but highly rated courses for you on Coursera. We hope you enjoyed reading our curated list of Unusual but highly rated courses at Coursera. Go ahead try them and send us feedback on how you liked them. P.S: For more traditional courses on Professional Development and Career Advancement at Coursera, You can learn the following courses on Writing Resumes and Interviewing for Jobs .